After packing plenty of chewable antacid tablets, I hit the road one rainy Saturday morning and made the drive from Topeka to Wichita. I normally prefer the less-busy highways that offer more scenic views, but I was traveling alone and in the rain and thought it best to stick to the Turnpike. The rain was light, and was bringing with it temperatures about 20 degrees cooler than we&apos;d had that week. As the front (and I) moved through the Flint Hills, I was in awe of the colors that painted my drive. A misty grey sky contrasted against the amazingly still-green grass of the undulating hills and valleys. The clouds gave way near the end of my drive and beams of sunlight began to poke through to cast golden rays on soybean fields that ranged from yellow-green to amber, with the occasional late season wild sunflower poking up here and there. It was one of the most beautiful drives I&apos;d ever enjoyed along I-35. When I arrived at the event, I found a large stage, flanked by rows of competitor tents that stretched for blocks. The official cooking start time was 9 a.m., and by now the aromas of garlic, onion, cumin and chili powder were wafting through the air. 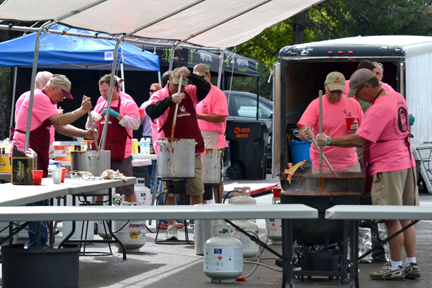 I found the Wagonmasters tent, where about 20 men in pink event t-shirts (the color chosen for Breast Cancer Awareness Month) were stirring large pots of chili over propane burners. I queried a few of the men and learned that the Wichita Wagonmasters are a group of civic-minded business leaders who work to promote and sell Wichita as a great place to live, work and play. Through fundraising events like the Cook-off, the Wagonmasters offer Good Life Grants to programs and organizations in improve the quality of life in Wichita. Apparently the Wagonmasters also make a great bowl of chili, as evidenced by the number of people that lined up for a bowlful. For just $5, attendees can buy a chili tasting kit, which includes a wrist band that gets you a one-ounce taste of chili at all competitor booths (as long as supplies last). You also receive colored beans with which you can vote for the People&apos;s Choice chili and your favorite Chili for Charity entry, as well a coupon for a free bowl of the Wagonmasters chili, just in case you didn&apos;t fill up while visiting the competitor booths. With a festival atmosphere, there are enough booths and events (live music, Mr. Hot Stuff and Ms. Chili contests and a chili eating competition) to keep you busy for several hours, so there&apos;s plenty of time to work up an appetite. Competitors submit entries in one or more categories for cash prizes of up to $500 and more importantly, bragging rights. Three categories (Salsa, ICS Green and ICS Red) are sanctioned by the International Chili Society, and winners in ICS categories qualify for the World Championship Chili Cook-off. One rule across all ICS categories is that no beans are allowed. Other categories at the Wagonmasters event are Anything Goes (including beans), People&apos;s Choice and Chili for Charity, a category that allows local charities to compete for a $500 donation. Look here for a complete list of winners. I highly recommend experiencing this event as a judge. You&apos;ll get an insider&apos;s view of the event and get to try lots of chili without waiting in line. Competitor samples are brought in marked only with a number, and set on a table with lots of spoons and palate-cleansers like sour cream, flour tortillas and tortilla chips. Each judge takes one bite of a chili, marks comments on the judging sheet, then moves on to the next sample. After tasting all entries in the category, each judge chooses their top three, then returns to the table for a last taste of those three to help with first, second and third place ranking. By the time I was finished judging the ICS Green and Chili for Charity categories (and helping out with a tiebreaker for the Anything Goes category), I had taken more than 40 bites of chili and was reaching burnout. I suggest signing up for just one category, then enjoying the rest of the event as a spectator so you can choose which kinds of chili you want to try. You might even have room left for your free bowl of Wagonmasters chili! After judging, I watched the chili eating competition, where about a dozen people tried to eat as many jalapenos as they could in five minutes. I&apos;ll admit that with 40 different kinds of chili churning in my stomach, I felt empathy and respect for the competitors. After the strong finish by one man who ate 15 chiles, I said my goodbyes to fellow judges with whom I&apos;d developed new friendships, popped a couple more antacids and hit the road for home. A month or two before this September event, sign up online to be a judge - no experience needed! The event takes place on the edge of Wichita&apos;s Old Town, a collection of shops, restaurants and attractions. Stay in an Old Town hotel and make it a walk-to weekend getaway.